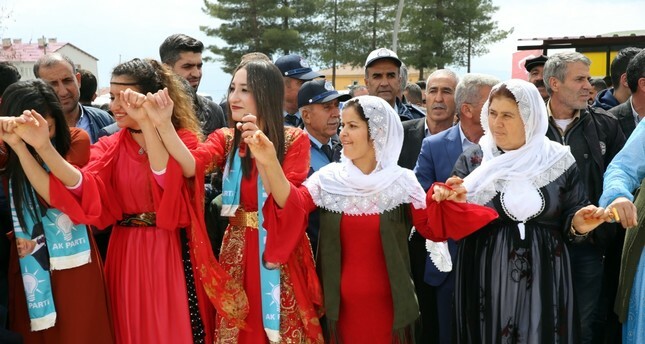 Local people in Şırnak celebrate the AK Party's victory in the region with Kurdish folk dances, April 1, 2019. Sunday's election results were surprising in many ways with voters making various unexpected choices. One of those unforeseen developments took place in the eastern part of Turkey, where Kurdish people are a majority, with citizens showing major support for the ruling Justice and Development Party (AK Party) and passing over the pro-PKK Peoples' Democratic Party (HDP). According to experts, these results reveal that by acting in such an unusual fashion, locals in the east voiced their support for the municipal services they have enjoyed since the appointment of trustees in the region while at the same time opposing PKK terrorism and maladministration. The HDP took the lead in three metropolitan municipalities, five other provinces, 50 districts and nine towns, all of them located in the eastern and southern regions of the country known to be HDP strongholds. However, this result is a blow for the HDP compared to previous local elections. In the 2014 local elections, the HDP was the leading party in the polls of three metropolitan municipalities, eight other provinces, 67 districts and 24 towns. In places where the HDP lost the support of the majority, the AK Party made the biggest gains. According to Özcan Tikit, a journalist based in Istanbul, the former HDP administrations' support for terrorism and the lack of municipal services were the main factors behind this downward trend for the HDP. Tikit said that people in the region have seen municipal services after the appointment of trustees: "The HDP transferred the resources of people to other places instead of delivering municipal services," referring to the former municipal administrations' close relations with the PKK. "After people were provided access to municipal services following the appointment of trustees, they realized the situation," he said. The HDP is known for its support of autonomy in regions where large Kurdish populations live. In addition, some of its members have been charged with or accused of having links to the PKK terrorist organization which has been fighting the Turkish state for more than 30 years and has killed more than 40,000 people. The PKK is listed as a terrorist organization by Turkey, the U.S. and the EU. Academic İdris Kardaş also stressed that people in the region have gained access to high-quality municipal services thanks to the trustees' efforts, "They have experienced the development of living conditions in their daily lives." The PKK resumed its decades-old campaign in July 2015 after a three-year cease-fire collapsed. Since then more than 1,200 people, including security personnel and civilians, have lost their lives in PKK attacks. During the process, some HDP municipalities directly or indirectly supported these violent terrorist activities. As a result, Turkey removed the elected administrations of 93 municipalities in the region for their links to the PKK terrorist group and appointed trustees to these municipalities in 2016. The new administrations' trustees have been welcomed by locals as they have brought new services and cut the money flow to the group. In the trustee-run municipalities, damaged infrastructure for drinking water, wastewater and sanitation has been repaired and new infrastructure has been built. Extensive construction work was undertaken by the trustees to revive the PKK-ravaged southeastern provinces. Vahdettin İnce, an author and Kurdish intellectual, said that the trustees have worked hard to provide high-quality municipal services to people in the region. "People realized that municipal administration is about municipal services, not identity," stated İnce. İnce also commented that people in the region were able to compare the services of political parties and chose the party that delivered the best results following the end of PKK pressure, a reference to the government's successful anti-terror operations following the end of a cease-fire in 2015. The trustees, mostly bureaucrats who served as district governors in the region, are lauded by the public for the numerous positive changes they have brought to towns and cities. In the trustee-run municipalities, damaged infrastructure for drinking water, wastewater and sanitation has been repaired and new infrastructure has been built. Extensive construction work was undertaken by the trustees to revive the PKK-ravaged southeastern provinces. Long-neglected infrastructure was completely renewed, new roads and social facilities were built while green spaces were increased. Municipalities' debts to local businesses were paid while schools, public buildings and other structures damaged in terror attacks underwent renovation. In provincial municipalities where the central government appointed trustees due to the local administrations' support for the terrorist organization, the HDP lost a significant amount of votes. The HDP's vote percentage dropped from 59 percent to 35 percent in Şırnak, from 67 percent to 60 percent in Hakkari, from 51 percent to 37 percent in Ağrı, from 42 percent to 28 percent in Tunceli and from 44 percent to 33 percent in Bitlis. Among city provinces where the HDP had the lead in 2014, they lost Ağrı, Bitlis and Şırnak to the AK Party while the Communist Party of Turkey (TKP) declared victory in Tunceli. On the other hand, the HDP took control of Kars municipality from the Nationalist Movement Party (MHP). The HDP also lost the support of people in many districts which were seen as HDP strongholds. Hakkari's Çukurca and Şemdinli districts, Şırnak's Beytüşşebap and Uludere districts, Diyarbakır's Hani district, Bitlis' Mutki district, Elazığ's Karakoçan district, Erzurum's Hınıs and Tekman districts, Kars' Digor district, Mardin's, Artuklu, Ömerli and Savur districts, Mersin's Akdeniz district, Siirt's Baykan and Eruh districts, Şanlıurfa's Halfeti, Bozova and Viranşehir districts, Van's Erciş, Gürpınar and Bahçesaray districts saw the AK Party lead in polls in contrast to the 2014 local elections results. Moreover, the Felicity Party (SP) clinched Batman's Beşiri and Iğdır's Tuzluca districts from the HDP; while the Democrat Party (DP) led the polls in Ağrı's Tutak district. In Digor, Çukurca, Uludere, Beytüşşebap, Karakoçan, Tekman, Savur, Baykan, Eruh, Halfeti, Bahçesaray, Gürpınar, Beşiri and Tuzluca, the HDP had gained more than half of voters' support in the 2014 elections. Tikit said that people in small cities and districts who have been victimized by the HDP's support of the PKK to dig ditches on the streets and launch attacks on police and soldiers, punished the HDP in the ballot boxes and demonstrated their support for the AK Party's services. On the other hand, Kurdish citizens in metropolitan municipalities such as Diyarbakır, Van and Mardin have maintained their support for the HDP. Looking at the metropolitan municipalities, the HDP led the polls in Diyarbakır, Van and Mardin as they did in 2014. The Mardin municipality was under HDP rule from 2014 to 2016. Ahmet Türk, a senior HDP figure, was elected as the mayor of the province in the 2014 local elections as an independent candidate. There are different opinions about this contrast between small cities and big cities. Tikit said that people in rural areas have become the main victims of terrorist activities in the region, while people in metropolitan cities still act with ideological motivations and identity politics. Kardaş said that the June 7 elections in 2015 were a time when the popularity of the HDP in the region had reached its peak level. Since then, the HDP has been losing its support and he predicts that this downward trend will continue. "The HDP could not distance itself from violence and people realized that," Kardaş said adding that the people who have been victimized by the municipalities' support of PKK activities have exhibited their dissent in this election. İnce said that the process of the HDP's fall has been happening gradually for some time and will continue.